Oceans are large bodies of salt water that surround Earth's continents and occupy the basins between them. The four major oceans of the world are the Atlantic, Arctic, Indian, and Pacific. These interconnected oceans are further divided into smaller regions of water called seas, gulfs, and bays. The combined oceans cover almost 71 percent of Earth's surface, or about 139,400,000 square miles (361,000,000 square kilometers). The average temperature of the world's oceans is 39°F (3.9°C). The average depth is 12,230 feet (3,730 meters). One scientific theory about the origin of ocean water states that as Earth formed from a cloud of gas and dust more than 4.5 billion years ago, a huge amount of lighter elements (including hydrogen and oxygen) became trapped inside the molten interior of the young planet. During the first one to two billion years after Earth's formation, these elemental gases rose through thousands of miles of molten and melting rock to erupt on the surface through volcanoes and fissures (long narrow cracks). Within the planet and above the surface, oxygen combined with hydrogen to form water. Enormous quantities of water shrouded the globe as an incredibly dense atmosphere of water vapor. Near the top of the atmosphere, where heat could be lost to outer space, water vapor condensed to liquid and fell back into the water vapor layer below, cooling the layer. This atmospheric cooling process continued until the first raindrops fell to the young Earth's surface and flashed into steam. This was the beginning of a fantastic rainstorm that, with the passage of time, gradually filled the ocean basins. Continental margin: Underwater plains connected to continents, separating them from the deep ocean floor. Fracture zone: Faults in the ocean floor that form at nearly right angles to the ocean's major ridges. Guyot: An extinct, submarine volcano with a flat top. Ridge: Very long underwater mountain ranges created as a by-product of seafloor spreading. Rift: Crevice that runs down the middle of a ridge. Seafloor spreading: Process whereby new oceanic crust is created at ridges. 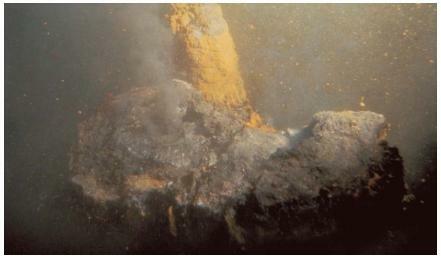 Seamount: Active or inactive submarine volcano. Cosmic rain. 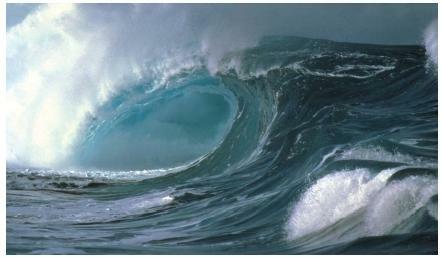 In mid-1997, however, scientists offered a new theory on the how the oceans possibly filled in. The National Aeronautics and Space Administration's Polar satellite, launched in early 1996, discovered that small comets about 40 feet (12 meters) in diameter are bombarding Earth's atmosphere at a rate of about 43,000 a day. These comets break up into icy fragments at heights 600 to 15,000 miles (960 to 24,000 kilometers) above ground. Sunlight then vaporizes these fragments into huge clouds, which condense into rain as they sink lower in the atmosphere. Scientists calculate that this cosmic rain adds one inch of water to Earth's surface every 10,000 to 20,000 years. This amount of water could have been enough to fill the oceans if these comets have been entering Earth's atmosphere since the planet's beginning 4.5 billion years ago. Ocean basins are that part of Earth's surface that extends seaward from the continental margins (underwater plains connected to continents, separating them from the deep ocean floor). Basins range from an average water depth of about 6,500 feet (2,000 meters) down into the deepest trenches. Ocean basins cover about 70 percent of the total ocean area. The familiar landscapes of continents are mirrored, and generally magnified, by similar features in the ocean basin. The largest underwater mountains, for example, are higher than those on the continents. Underwater plains are flatter and more extensive than those on the continents. All basins contain certain common features that include oceanic ridges, trenches, fracture zones, abyssal plains, and volcanic cones. Oceanic ridges. Enormous mountain ranges, or oceanic ridges, cover the ocean floor. The Mid-Atlantic Ridge, for example, begins at the tip of Greenland, runs down the center of the Atlantic Ocean between the Americas on the west and Africa on the east, and ends at the southern tip of the African continent. At that point, it stretches around the eastern edge of Africa, where it becomes the Mid-Indian Ridge. That ridge continues eastward, making connections with other ridges that eventually end along the western coastline of South and Central America. Some scientists say this is a single oceanic ridge that encircles Earth, one that stretches a total of more than 40,000 miles (65,000 kilometers). In most locations, oceanic ridges are 6,500 feet (2,000 meters) or more below the surface of the oceans. In a few places, however, they actually extend above sea level and form islands. Iceland (in the North Atlantic), the Azores (about 900 miles [about 1,500 kilometers] off the coast of Portugal), and Tristan de Cunha (in the South Atlantic midway between southern Africa and South America) are examples of such islands. Running along the middle of an oceanic ridge, there is often a deep crevice known as a rift, or median valley. This central rift can plunge as far as 6,500 feet (2,000 meters) below the top of the ridge that surrounds it. Scientists believe ocean ridges are formed when molten rock, or magma, escapes from Earth's interior to form the seafloor, a process known as seafloor spreading. Rifts may be the specific parts of the ridges where the magma escapes. Trenches. Trenches are long, narrow, canyonlike structures, most often found next to a continental margin. They occur much more commonly in the Pacific than in any of the other oceans. The deepest trench on Earth is the Mariana Trench, which runs from the coast of Japan south and then west toward the Philippine Islands—a distance of about 1,580 miles (2,540 kilometers). Its deepest spot is 36,198 feet (11,033 meters) below sea level. The longest trench is located along the coast of Peru and Chile. Its total length is 3,700 miles (5,950 kilometers) and it has a maximum depth of 26,420 feet (8,050 meters). Earthquakes and volcanic activity are commonly associated with trenches. been sliced up by a giant knife. The faults in a zone usually cut across ocean ridges, often nearly at right angles to the ridge. A map of the North Atlantic Ocean basin, for example, shows the Mid-Atlantic Ridge traveling from north to south across the middle of the basin, with dozens of fracture zones cutting across the ridge from east to west. Abyssal plains. Abyssal plains are relatively flat areas of the ocean basin with slopes of less than one foot of elevation difference for each thousand feet of distance. They tend to be found at depths of 13,000 to 16,000 feet (4,000 to 5,000 meters). Oceanographers believe that abyssal plains are so flat because they are covered with sediments (clay, sand, and gravel) that have been washed off the surface of the continents for hundreds of thousands of years. On the abyssal plains, these layers of sediment have now covered up any irregularities that may exist in the rock of the ocean floor beneath them. Abyssal plains found in the Atlantic and Indian Oceans tend to be more extensive than those in the Pacific Ocean. One reason for this phenomenon is that the majority of the world's largest rivers empty into either the Atlantic or the Indian Oceans, providing both ocean basins with an endless supply of the sediments from which abyssal plains are made. Volcanic cones. Ocean basins are alive with volcanic activity. Magma flows upward from the mantle to the ocean bottom not only through rifts, but also through numerous volcanoes and other openings in the ocean floor. Seamounts are submarine volcanoes and can be either active or extinct. Guyots are extinct volcanoes that were once above sea level but have since receded below the surface. As they receded, wave or current action eroded the top of the volcano to a flat surface. Seamounts and guyots typically rise about 0.6 mile (1 kilometer) above the ocean floor. One of the largest known seamounts is Great Meteor Seamount in the northeastern part of the Atlantic Ocean. It extends to a height of more than 1,300 feet (4,000 meters) above the ocean floor. i really like this page it gives a lot of good information. This article has been a super help for me, I have found all the info. That I need it to finish my Oceanography home work. Thank you. i really like this page, it has alot of information, and im really interested in the knowledge that this provides for us, it's really helpfull. I really like this page, it has tons of information that I have always wanted to know like how the Earth's oceans were formed.